Of bringing vital legal services to communities in need in the Bay Area. 2 years ago, under the leadership 0f Association of Pro Bono Counsel (APBCo) and Cooley LLP, the Bay Area Rural Justice Collaborative IMPACT (Involving More Pro Bono Attorneys in Our Communities Together) project was born. The Bay Area Rural Justice Collaborative, a collaboration of legal services organizations and law firms, strives to increase access to legal services in isolated communities through free limited scope legal clinics staffed by pro bono attorneys. 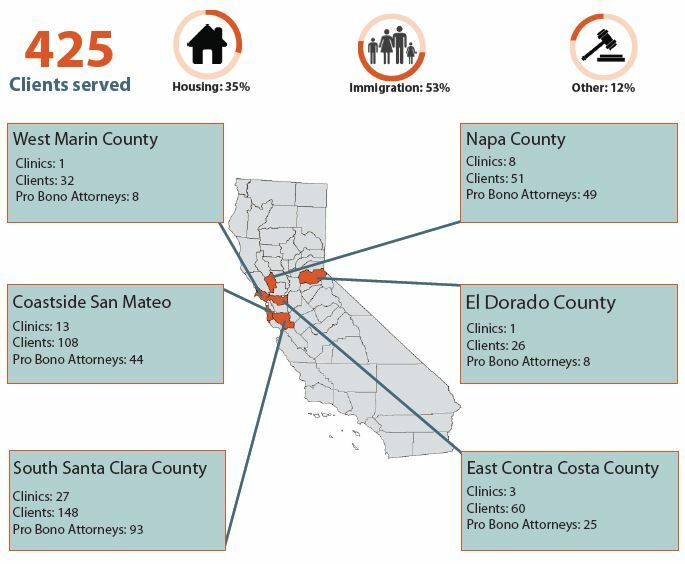 Since 2013, the Rural Justice Collaborative has served 425 clients through 53 mobile legal clinics ran by 227 Bay Area pro bono attorneys. We couldn’t be more thankful for the support of our donors, legal services and law firm partners, and volunteer attorneys for making each and one of these clinics possible. Here’s to many more! Thank you to our legal services, nonprofit, law firms and corporate partners for making all of this possible! You are all amazing! Interested in learning more about the Rural Justice Collaborative? Lauren Roberts manages the Bay Area Rural Justice Collaborative at OneJustice, engaging law firms and in-house counsel in a network of monthly mobile legal clinics. Together, they bring life-changing legal assistance to hundreds of rural Californians facing pressing legal problems.